Vellum paper is a semi transparent paper that gives a pretty soft look when layered on your cards. You can use permanent inks or heat embossing to stamp on vellum. Coloring on the back side of vellum with markers or colored pencils mutes the colors a bit and helps to add to the soft appearance. 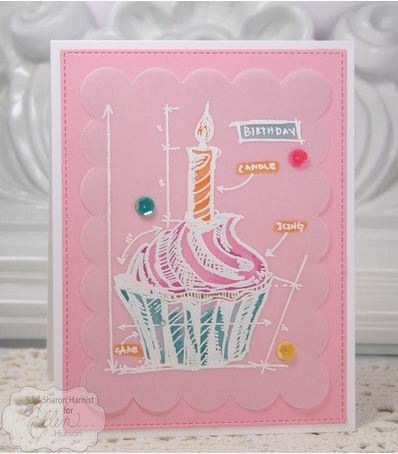 Visit Ellen Hutsons Classroom blog for direction on how to emboss and color on vellum with alcohol ink markers for a fun birthday cup cake card.